A 270 Dauntless empowers one couple's adventures on Lake Michigan and beyond. Spend a few minutes in conversation with Chris O’Shaughnessy and you start to wonder if the word “can’t” even enters his vocabulary. The Michigan City, Indiana, resident and his wife, Kathy, embody the spirit of can-do-it-ness that defines many a Whaler owner. It’s a mix of confidence, enthusiasm and know-how that leads to countless adventures on the water. The 270 Dauntless is the couple’s third Whaler; they started out with a 170 Montauk in 2008, moved to a 200 Dauntless in 2011, and went for the 270 in 2016. No strangers to boating, they’ve owned other brands concurrently with their Whalers, but nothing seems to hold their favor quite as well. The Midwest offers plenty of fertile boating ground to explore, and Chris and Kathy work to maximize their time between the colder months. With the Whaler in tow, they frequent destinations all around the region. Patoka Lake, Indiana’s second-largest reservoir, is heavily stocked with bass, bluegill, catfish and walleye, tempting them to wet a line. It’s also prime for swimming and waterskiing. South Haven, Michigan, is another favorite spot, offering up nature trails, golf courses, fine dining and nightlife—and, of course, easy access to and from Lake Michigan. Farther afield, the charms of Mackinac Island draw the couple all the way to Michigan’s Upper Peninsula from time to time. Limited to transportation by horse-and-buggy, bicycle or foot, Mackinac’s historic architecture, bustling downtown area and world-famous fudge all do their part toward making the trip worthwhile. Their good friends Bob and Lori McKean often join them on impromptu outings. They cite the Stray Dog restaurant in New Buffalo as a favorite hangout, a place to soak up harbor views from an upper deck. More often, though, you’ll find the two couples more directly engaged with the water. Chris and Kathy also enjoy making overnight trips to Chicago, where they’ll keep the Dauntless at Burnham Harbor and stay with friends in the city. Everywhere they go, they seem to meet fellow Whaler owners who share their enthusiasm. They welcome the attention it draws. “Whaler guys are really the best. You see another Whaler owner or boat, and you can count on an hour-long conversation right there,” Chris says. The O’Shaughnessys have been customers of B&E Marine since 2008, when they purchased their first Whaler, and have nothing but praise for the dealership. “Our sales rep, Terry Belue, is phenomenal. He does everything he can to make the buying experience—well, maybe ‘fun’ isn’t the right word, but he goes the extra steps,” Chris says, laughing. A tour of the Boston Whaler manufacturing facility in Edgewater, Florida, was another highlight of the process. “Really neat to see where the magic happens!” they agree. Florida showed the couple a good time all around. They took the 270 Dauntless to Boca Raton before cruising down to Miami and checking out the sunny beaches of Key Biscayne. “We’re so used to being up on Lake Michigan, it was great to do some open-water boating,” Kathy says. Wherever their next adventure takes them, they’re sure to embrace it with open arms. And if those arms happen to be clothed in a Whaler shirt, all the better. 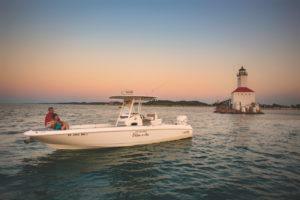 Join the Boston Whaler Community - and see where your adventures lead you.